St Kentigern’s Primary were looking for a way to excite pupils and to create a new and dynamic learning environment. Upon appointment in 2011, the new headteacher observed there was little excitement for learning and extra curricular activities were minimal. The school had become ‘flat’ for their pupils and this was reflected in results, particularly at KS2. 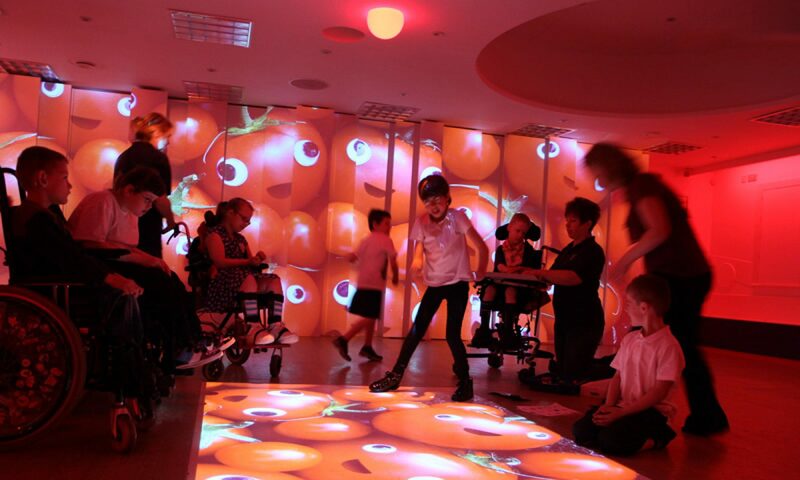 As part of several new initiatives, the school commissioned 4D to install an immersive space. The space chosen was an outdated and tired ICT suite that needed renovation and a new lease of life. Even before the space was installed, 4D Immersive began to work with St Kentigern’s staff and pupils; a group of pupils, governors and staff visited the 4D office to learn more about their work and grew to see how an immersive space could impact their school. This initial understanding meant staff and pupils were particularly excited and expectant when their immersive space was installed. The space at the school started life as a tired and outdated ICT suite which we needed to inject with a new wow factor – this had to be a space that would engage pupils like never before and give them a renewed enthusiasm for learning across the curriculum. 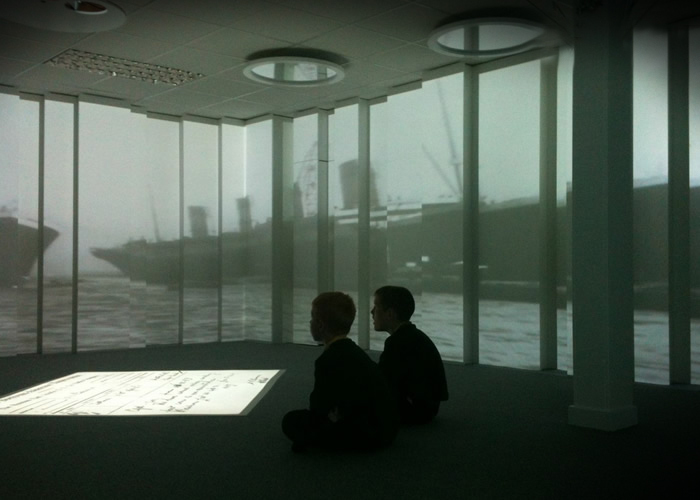 A giant area of corner projection was installed with a large interactive floor. There was also a second area of projection which was ideal for presentations and for text heavy documents. To add an extra wow factor, our design team installed several glowing ceiling features and LED lighting globes. These added a real sense of occasion and magic to the finished immersive space. A wall of vinyl artwork also added an extra finishing touch, along with a den making kit. 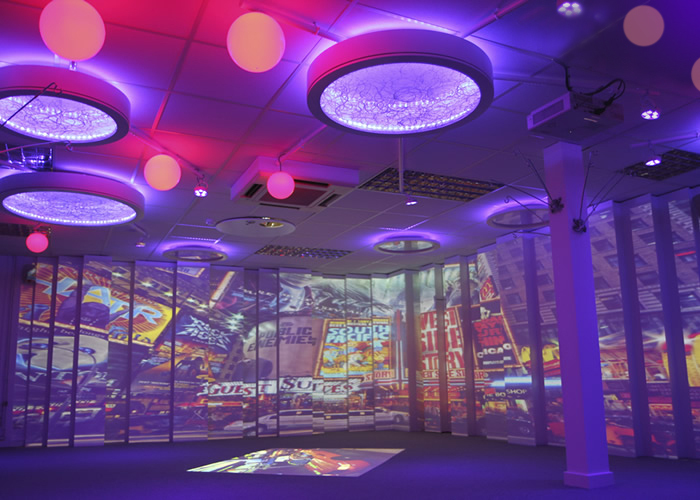 With the finished immersive space named ‘The Dream Zone’ by the school, our focus then turned to giving staff all the training they needed to use their new creative classroom across the curriculum. The Dream Zone is becoming an integral part to enhancing our approaches to teaching and learning. It promotes: improved language skills and supports assessment; children’s construction of meaning; greater empathy between teachers and children; flexible and creative thinking about teaching and learning; learning is a dynamic interactive way; the emotional aspects. It provides a vibrant and stimulating learning journey for children. It supports thinking skills (particularly the Higher Order Skills, analysis, evaluation, synthesis and creativity). Because of the interactive nature of the Dream Zone children are developing a greater understanding of lesson objectives. The Dream Zone has provided an environment which values questioning, particularly that which challenges thinking. Staff reported improvements in speaking and listening skills. There was noticeable improvement in pupils’ desire to write in classroom follow-up work (especially boys). This is because pupils now have a greater awareness of writing for a purpose. Y5/Y6 written work which has been moderated showed improvements in pupils’ writing. This will continue to be a feature of measuring improvement. It is clearly an important and supportive process to learning as part of the overall learning programme. It is promoting the exercise of social language skills to encourage answers to questions. Pupils’ attitudes to learning are discernibly enhanced in the Dream Zone. There is evident excitement, intrinsic and motivation and interest in their learning. There is a sense of awe and wonder among children and staff when in the Dream Zone. Children are immersed in their learning. As one child has said “it is actually like being there when you‘re not”. Staff are finding that the Dream Zone is not only helping children to learn actively, but it is also strengthening their capacity to learn. It encourages flexibility as a move away from the restrictions of a classroom space i.e. a move away from the rigidity of the 8 x 4 x 2 model (8 corners, 4 walls and two pages of a book).